When it comes to protein, all are not created equal. My Top 7 that I chose are all lean, low in calories, cholesterol and fat. 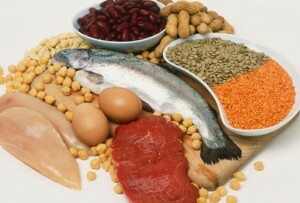 Protein is the building block of muscles. The primary function of protein is to build and repair body tissues and structures. Additionally, if calories or carbohydrates are insufficient in the diet, protein can be used to restore energy in the body. If protein intake exceeds the need for synthesis and energy needs are met, the extra protein consumed can be stored as fat. Protein yields 4 calories per gram. Whether at home or dining out, grilled, broiled, or baked are the best way to prepare your protein, with little salt and butter added. Some of you might be wondering: Is too much protein a bad thing? It is important to not consume more than the recommended daily allowance (RDA) of protein, because this can imbalance the stability of your body and cause a chronic high-protein intake. Just remember – keep the daily balance and you’ll benefit greatly from it while working out. If losing weight is your goal, keep in mind that the more muscle you build (by eating protein and working out), the more standing calories you burn!